Oceanfast is a boatyard that specialises in the production of super-yachts, in business since 1984 on the western Australian coast, just a little further south than the port city of Fremantle. In 1999 Oceanfast opened a branch in Florida in order to meet the requests of the United Sates market, then followed by other branches in Europe and in Japan. At present the boatyard uses the workforce of three companies, all being part of Austal, the company that acquired Oceanfast in 1999 and that employs around 1,700 people including engineers, architects, technicians and workers. This Australian boatyard has received numerous international awards for the boats it has produced so far. Among these, we highlight the 'Australian Design Award' in 1989, the 'Most Original Interior Design' in 1990 and another six awards up to the last two in 2002, the 'Large Advanced Manufacturer Award' and the 'Western Australian Industry and Export Award'. One of the latest creations by Oceanfast is called 'Sycara III', an over 50- metre motor yacht, commissioned by an owner as his third yacht produced by the Australian boatyard. This is a project that develops over four decks, of which two above the main one and one below, the latter reserved for the service areas and mechanical and electrical systems. The hull is in steel, while the upper works are in composite, chosen by the boatyard to optimise weight and distribution in order to give 'Sycara III' high stability and performance qualities. 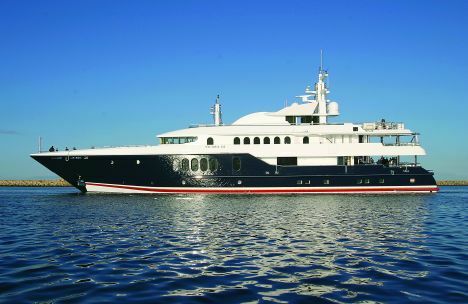 The external lines were designed by Jon Bannenberg, who died last year and was considered by George Nicholson, with whom he worked intensely during the first years of his activity, to be one of the most charismatic and talented yacht designers of his time. Still according to Nicholson, of the most important boats designed by Bannenberg, mention must go to 'Carinthia V' and 'Carinthia VI', twin yachts produced in the seventies and looked upon as icons in yacht design. But Bannenberg lent his name to over 200 projects for boatyards all over the world such as Benetti, Feadship, Lurssen, Royal Huisman and many other resonant names from the world of international boatyards. To go back to 'Sycara III', after a due mention of the pencil that created her external lines, let us highlight the presence on the main deck of five double cabins for guests, while the lower deck has the crew's quarters, with room for up to 14 members in comfort and sufficiently independent from life on board of the owner and guests. Sycara III's interiors have all been studied to offer the owner and guests maximum comfort during their time on board; moreover there are areas reserved for formal meetings and parties both outside and inside, and areas furnished as studies and offices with avant-garde communication systems. Design of the hull and upper works together with the techniques used in building this yacht make 'Sycara III' a modern and aesthetically balanced pleasure boat. The technology used by the boatyard for building her and the sophisticated systems she is equipped with mean that 'Sycara III' is a boat on which her owner can sail the oceans in absolute safety and maximum comfort. For further information please contact Oceanfast Pty Ltd; 18 Clearence Beach Road; Henderson 6166 Western Australia; tel. +61 (0)8 9494 9999; fax +61 (0)8 9494 9900; website www.oceanfast.com.au; e-mail boats@oceanfast.com.au.